The pope may be infallible, but apparently he’s not immune to flat tires. 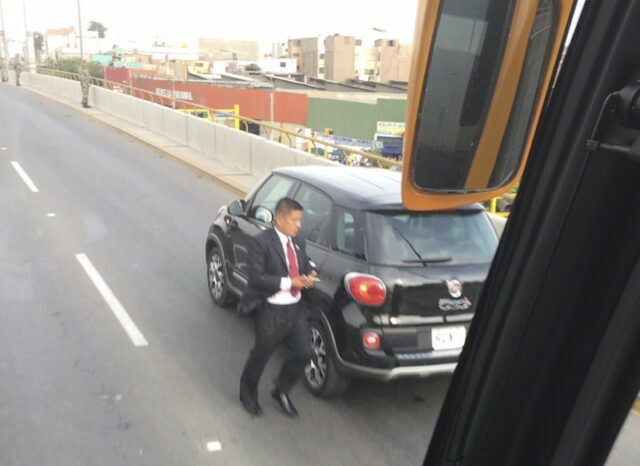 Francis had to change cars en route to Lima from the airport on Friday after the Fiat 500 he was riding in got a flat. Vatican spokesman Greg Burke confirmed the change of plans in a message to journalists. He said the tire started losing air a few miles (kilometers) from the presidential palace, where Francis was due to meet with Peruvian President Pedro Pablo Kuczynski. The pope didn’t lose a beat, using the meeting and subsequent speech to Peruvian authorities to denounce corruption as a “social virus” that infects all aspects of life and must be combatted. Pope Francis is calling corruption in Latin America a “social virus” that infects all aspects of life and must be combatted. The pope’s remarks come less than a month after Kuczynski narrowly escaped impeachment over his private consulting firm’s ties to Odebrecht, the Brazilian construction company at the center of Latin America’s biggest corruption scandal. Two former Peruvian presidents have been accused of receiving money from Odebrecht. The president of the Amazon’s largest indigenous organization is praising Pope Francis’ call to protect the fragile ecosystem and recognize its native peoples. Lizardo Cauper is one more than 2,000 indigenous people who gathered at a coliseum in Peru on Friday to hear the pontiff speak. Now Cauper says indigenous communities will be waiting to see if the government engages them better in decisions that impact the biome. In his speech Francis called the Amazon the “heart of the church” and demanded an end to relentless exploitation of timber, gas and gold. Pope Francis is criticizing sterilization campaigns that have targeted indigenous people during a speech to Amazonian communities in Peru. It’s a topic likely to strike a chord in a country where more than 300,000 women were sterilized during the 1990-2000 government of former President Alberto Fujimori. Officials said back then that the campaign aimed to reduce poverty. On Friday the pontiff decried organizations that promote “reproductive policies favoring infertility” and said some continue to advocate for the sterilization of women — even without consent. Many of the women sterilized during Fujimori’s administration were illiterate and came from poor, indigenous communities. More than 2,000 later came forward to complain that they had been forcibly sterilized. Francis tucked his remarks into a footnote in his speech, perhaps knowing they would be politically sensitive. Pope Francis is denouncing sexual enslavement of women in the Amazon who are trafficked and forced into prostitution, saying the “machismo” culture cannot stand. Many women work as prostitutes in the region’s bars, servicing clients who often work in gold mines and other extraction industries that are polluting the Amazon’s rivers, destroying its forests and upsetting its delicate ecosystem. Francis denounced the “false gods” of the gold rush Friday and said that these “idols of avarice, money and power” corrupt people and institutions and ruin the forest. Standing with thousands of indigenous Peruvians in a riot of feathers and beaded jewelry, Francis declared the Amazon the “heart of the church” and called for a three-fold defense of its life, land and cultures. The pontiff warned Friday that indigenous peoples are now more threatened than ever before. Francis added that it’s essential for governments and other institutions to consider tribes as the legitimate partners when negotiating development and conservation projects. He said their rights, cultures, languages and traditions must be respected and recovered. Amazonian indigenous leaders in Peru are urging Pope Francis to help them protect the world’s largest rainforest from an onslaught of new threats that are dramatically changing the biome. One of the leaders is Hector Sueyo. He tells Pope Francis that native peoples are worried about the Amazon as trees disappear, fish die and rivers become contaminated. Thousands of indigenous men, women and children, many bare-chested and wearing colorful headdresses are gathered in a coliseum to hear Francis speak. Pope Francis is receiving a warm welcome in the Peruvian Amazon city of Puerto Maldonado, with supporters lining the streets to greet him ahead of the pontiff’s planned meeting with indigenous people. Some are running up along the pontiff’s motorcade carrying balloons in the white and yellow colors of the Vatican, while others cheer and wave. Friday’s scene is a stark contrast to the pope’s visit earlier this week to Chile, where he drew smaller crowds and his presence provoked protests. Indigenous leaders are hoping the pope will deliver a forceful message encouraging the government to recognize their land rights and clean up rivers contaminated by illegal mining. Francis has previously spoken about the need to protect the Amazon.